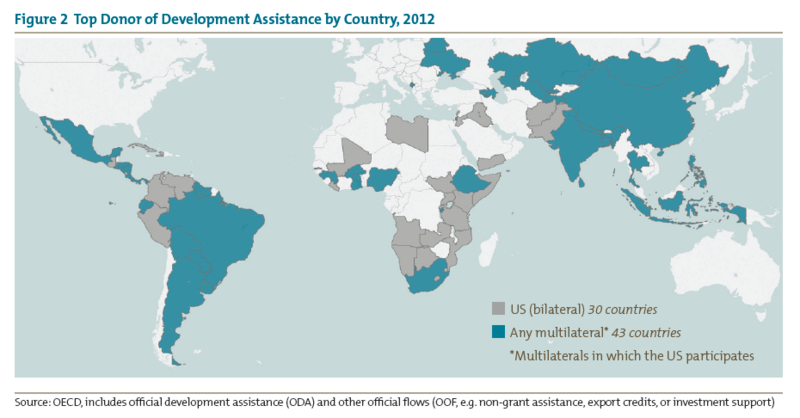 Establish a multilateral assistance target (e.g., 20 percent of total US foreign assistance). Conduct a multilateral aid review and reallocate scarce budgetary resources to effective institutions that advance US policy objectives. Improve budgetary and policy coordination mechanisms within the US government to ensure coherent decision-making about multilateral funding levels. US leadership in multilateral institutions such as the World Bank and regional development banks is flagging. These institutions, rated as some of the most effective development actors globally, provide clear advantages to the United States in terms of geostrategic interests, cost-effectiveness, and results on the ground. Those are among the reasons the United States played a leading role in creating the institutions and has continued to support them over many decades. Yet the US position in these institutions is less certain today. As a multilateral development bank (MDB) donor, the United States has fallen behind other countries, and it is increasingly seen as an obstacle to expanding MDB capital to address higher demand in the developing world for lending and investment. Today, the United States too often takes a defensive posture in the MDBs, with a policy agenda set more by budgetary constraints at home than by a clear vision of US goals and priorities abroad. This defensive posture in turn is weakening the global preeminence of the MDBs themselves, as many members of the World Bank and regional development banks are now turning their attention to new institutions such as the Chinese-led Asian Infrastructure Investment Bank (AIIB), frustrated by the lack of growth and slow pace of change in the traditional MDBs. Restoring US leadership in institutions like the World Bank will mean giving a greater priority to MDB funding, which today accounts for less than 10 percent of the total US foreign assistance budget and less than 0.1 percent of the total federal budget. Prioritizing multilateral assistance in an era of flat or declining foreign assistance budgets will necessarily mean some reallocation from other pots of foreign assistance money, as well as an effort to address the structural impediments to considering reallocations. Currently, there is no policy target for the multilateral share of the foreign assistance budget, despite a commitment to “renew” US multilateral leadership in the 2010 Presidential Policy Directive on Global Development. There is also no policy framework that guides decisions related to multilateral commitments across agencies. Instead, each multilateral program is considered within its own agency budget silo (largely the Departments of State and Treasury), leading to fragmented and ineffective decision-making. Remedying these weaknesses would start with a policy-level budget target for multilateral assistance, defined as a percentage of the foreign assistance budget. Such a policy goal would help to protect multilateral contributions from the inherent political biases in favor of bilateral assistance. Proceeding from such a target, a common framework for prioritizing multilateral financial commitments across the lead agencies would allow the next presidential administration to determine which of the multilateral institutions provide the most value to the United States and are best aligned with US development objectives. This approach would not only allow a more effective use of our limited development dollars but also leverage the powerful position of the United States within these multilateral organizations to make them more effective. In this brief, we make the case for more multilateralism within US development policy. We examine the value of multilateral assistance to the United States, as well as the problems of the current budgetary decision-making approach that leads to the flow of too little money into too many multilateral institutions. Recommendations for a new multilateral target and decision-making structure follow from this analysis. All donors employ a mix of bilateral and multilateral development assistance. Although US bilateral assistance — from headlining programs like the President’s Emergency Plan for AIDS Relief (PEPFAR) to targeted support for strategic countries — has played and will continue to play the foundational role in US development policy, the unique characteristics of multilateral assistance merit its elevation in the development agenda. The case for multilateral assistance, drawn here in part from the US government’s own arguments, can be thought of in six categories: leverage, instruments, geographic and sectoral scope, political buffers, effectiveness, and finally, the “privilege” the United States enjoys by being the largest collective shareholder in the MDBs. This dynamic financial model contrasts sharply with most US bilateral assistance, which by definition has no multidonor leverage. Typically, there is not any capital leverage either, since almost all US bilateral assistance has been provided as grants since the early 1980s. The range of instruments provided by multilateral institutions is greater than those employed by the United States bilaterally. The biggest difference is the prominence of loans in MDB programs and the paucity of them within US bilateral programs (see figure 1). Similarly, multilateral institutions offer far more in the way of equity investment, guarantees, insurance, and knowledge products. Increasingly, nongrant instruments are better aligned with major development initiatives such as infrastructure investment and private-sector development. These characteristics often make the MDB model more attractive to recipients relative to the US government’s traditional grant-based model. Moreover, multilateral institutions can provide multiyear financing commitments; that is difficult to do bilaterally because of the annual appropriations process. Multilateral institutions operate in more countries and sectors than US bilateral programs, offering the United States the ability to focus its bilateral programs on fewer countries while still maintaining broader geographic reach and influence through the multilateral channel. The United States is the largest donor in 30 countries worldwide. But these are clustered in regional pockets, mainly in eastern and southern Africa (because of large health and agriculture programs) as well as in frontline countries like Afghanistan, Pakistan, and Libya (see figure 2). On the other hand, US-supported multilateral organizations are the top donors in 43 countries across nearly every region. The multilaterals also tend to have far more presence in middle-income countries, with lending and investment programs that are better matched to these countries’ financing needs than the grant-dominant model employed by the United States. The MDBs also offer much greater sectoral diversity to US development policy. 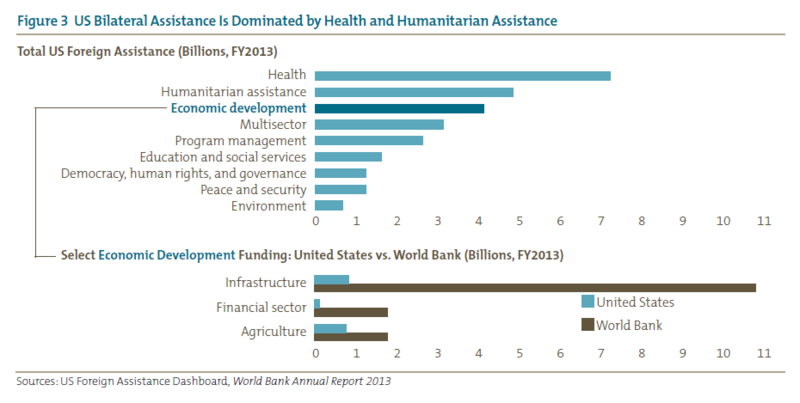 Despite a great deal of rhetoric about US policy’s supporting broad-based development, the bilateral assistance budget continues to be dominated by health and humanitarian assistance (see figure 3). MDB dominance in infrastructure finance explains why the institutions play explicit roles in prominent US initiatives such as Power Africa, where most traditional bilateral grant programs are not well matched to the objectives of the initiative. Multilateral assistance often provides a useful political buffer at home and abroad. At times when US bilateral support for a particular country, sector, or program is politically problematic at home, multilateral institutions allow the United States to maintain support but at arm’s length when it has a compelling reason to do so. For example, in 2010, the United States “abstained” on a decision at the World Bank to finance a large coal-fired power plant in South Africa. The US government formally withheld its support amid competing environmental, development, and diplomatic interests. Nonetheless, the US abstention came with an implicit understanding that the project would be approved by the broader World Bank board of directors. A contemporaneous US Treasury statement reflected the mix of competing interests, as well as the utility of an arm’s-length decision, by formally opposing the project while clearly acknowledging the merits of its going forward. Multilateral institutions also provide the United States a political buffer in other countries, where direct engagement with US officials is problematic. For example, the US-Pakistan relationship has experienced degrees of estrangement over the years in part because of a shifting domestic political environment within Pakistan. In fact, public-attitude surveys suggest that nearly 90 percent of Pakistanis have an unfavorable view of the United States. Nonetheless, Pakistan has compelling development needs and remains a geopolitically important country for global security, counterterrorism, and other national security issues. In cases such as this one, the World Bank and regional development banks can provide a stable source of financing, even when the US relationship has soured. In general, by allowing for degrees of political separation, the MDBs can be a better instrument than the US government for driving difficult reforms in politically sensitive sectors such as energy and banking when the United States has defined them as a priority in a bilateral relationship. 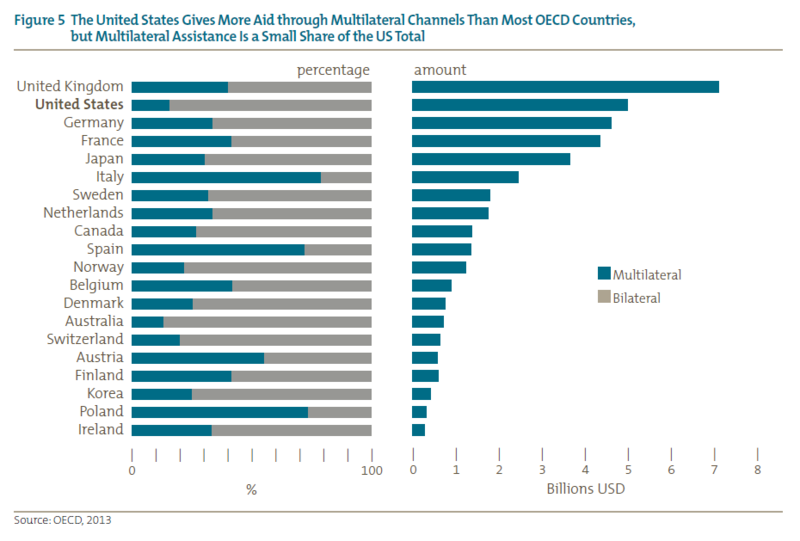 Multilateral channels afford the United States more opportunities to achieve positive development outcomes with its foreign assistance dollars. 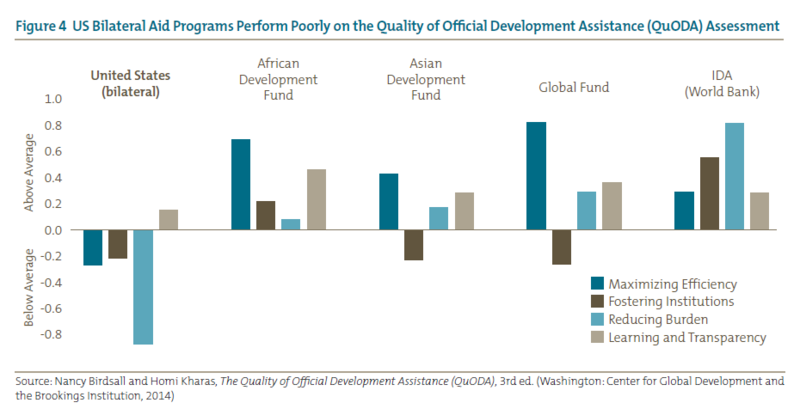 In various initiatives that evaluate global aid agencies, multilateral organizations have consistently outperformed bilateral institutions in organizational effectiveness (overhead, transparency, and learning), programming (fragmentation and specialization, alignment with country priorities), and “best practices” (selectivity against corrupt recipients, limiting tied or ineffective types such as food aid).Figure 4 reports the performance of US bilateral aid programs as a whole relative to the leading multilateral programs according to the 2014 edition of the Quality of Official Development Assistance Assessment (QuODA). Not only do US bilateral programs underperform against the average of all aid agencies (more than 100 agencies and 35 donor countries) in the study, but they greatly underperform on all four dimensions against the major multilateral agencies, defined here as the International Development Association (IDA) at the World Bank, the African Development Fund at the African Development Bank, the Asian Development Fund at the Asian Development Bank, and the Global Fund to Fight Aids, Tuberculosis and Malaria. All of the aforementioned benefits depend to some degree on US influence within the multilateral institutions. The United States enjoys particular benefits from being the largest (or second-largest) shareholder in these institutions, relative to other countries. Unlike the governance system of the United Nations, which relies on “one country, one vote,” the MDBs employ weighted shareholding, which gives the United States greater say as a large shareholder, both formally through voting power within the institution and informally through direct access to senior management of the institutions. As the largest shareholder at the World Bank, Inter-American Development Bank, and Asian Development Bank (along with Japan), the United States has unique formal power in the form of veto authority over key decisions in the board of directors, as well as a unique degree of informal influence, evidenced by the ability of the United States to shape broad policies (procurement rules, environmental safeguards) and programs of the MDBs as well as to steer them to particular initiatives, such as extraordinary support for Afghanistan during the past decade or financing the post-earthquake response in Haiti in 2010. Of course, the value of being the top shareholder in the MDBs also depends on the value of the MDBs themselves and, in particular, how much they continue to matter to the rest of the world. In the remainder of this brief, we describe how the United States is failing in this regard and what can be done about it. Despite the benefits of multilateral assistance, the United States greatly favors funding bilateral over multilateral channels. This imbalance is especially acute when compared against other donor countries. In 2013, the United States channeled $5.1 billion through all multilateral agencies (the MDBs plus other multilateral funds), or just 16 percent of the $31 billion the United States provided in total net development assistance. The average multilateral share for members of the Organisation for Economic Co-operation and Development (OECD) is 41 percent, putting the United States at 19th out of the 20 largest donor countries (see figure 5). 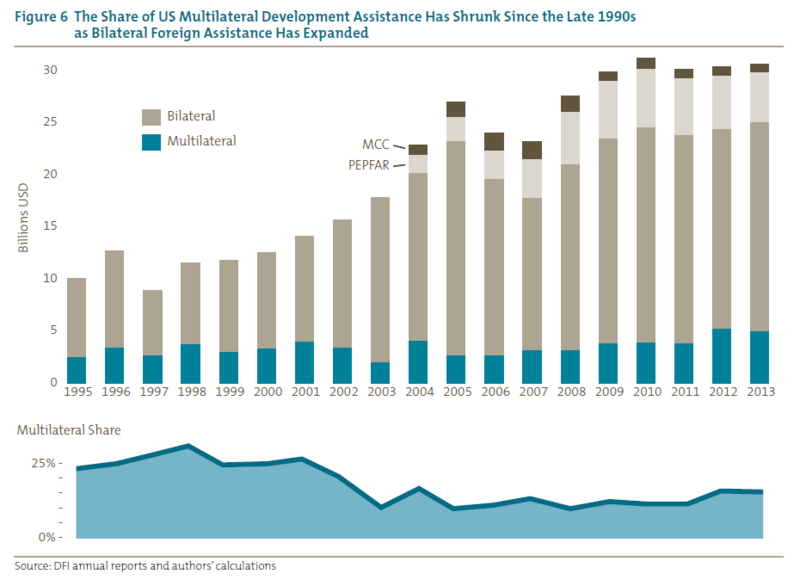 The multilateral share of the US foreign assistance budget has declined from an average of 27 percent in the late 1990s (see figure 6), the result of a dramatic expansion of bilateral foreign assistance programs during the years 2000 to 2013, such as PEPFAR, the Millennium Challenge Corporation (MCC), and large bilateral programs in Afghanistan, Pakistan, and Iraq. The United States clearly is underfunding multilaterals on a relative basis. At the same time, it is providing these modest resources through too many multilateral channels. 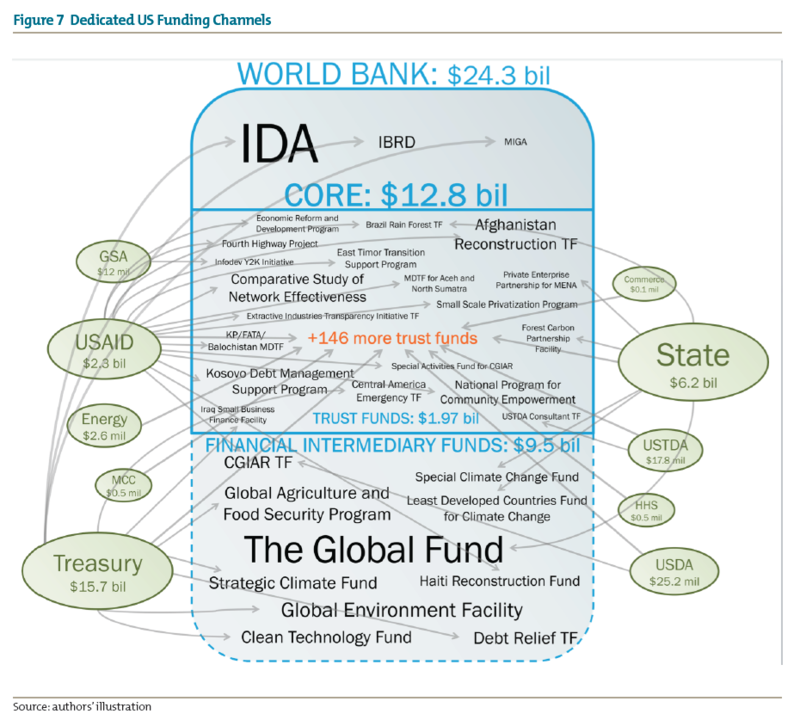 The World Bank alone receives support from 10 different US government agencies through more than 175 dedicated channels, most of which are trust funds. These proliferated funds are difficult to track, often have overlapping mandatesand one-off financing patterns, and broadly contribute to an inefficient and incoherent system (see figure 7). There are a number of reasons why the US multilateral agenda is underfunded and lacking coherence. Decisions about multilateral funding are spread across multiple agencies. A majority of US multilateral funding flows through Treasury’s International Affairs budget, followed by global health funding decisions made through the State Department budget process. A distant third are many small decisions made mostly by the United States Agency for International Development (USAID) with regard to multilateral trust funds. The Treasury Department’s International Affairs budget almost wholly comprises multilateral commitments. As a result, these funding decisions cannot draw on potential trade-offs between multilateral and bilateral programs. Further, existing budget processes do not consider bilateral and multilateral trade-offs between agencies. The only coordination occurs between each agency and the White House Office of Management and Budget (OMB). However, OMB seeks only to enforce what is typically a small decrease or increase in the agency’s budget over the previous year’s budget. Existing executive branch budgeting processes fail to consider trade-offs across agency budgets, including both multilateral and bilateral allocations. Similarly, absent overarching policy direction, existing coordination mechanisms do not seek to prioritize among multilateral programs. This situation contributes to the lack of coherence and fragmentation evidenced in figure 7. This bureaucratic breakdown has led to surprising outcomes. For instance, in 2013, US contributions to single-issue vertical funds such as the Global Fund (overseen by the State Department) surpassed those of the World Bank’s global, multisector concessional finance institution (managed by the Treasury Department). A further example is the Obama administration’s decision to cut core funding for the African Development Bank (AfDB) even as the president was championing the AfDB’s role in his signature Power Africa initiative. Even more confounding, the AfDB cut was juxtaposed with a USAID decision to contribute $5 million to a small energy-related trust fund at the AfDB, funds that could have been better leveraged through the bank’s core operations. The sum of these failures is a diminished US position in the MDBs, and a diminished position for the MDBs themselves as they are forced to reject capital increases because of US opposition. The positive reception that China’s AIIB has received in Asia, with 57 member countries and counting, comes on the heels of frustrated multiyear efforts within the Asian Development Bank (ADB) and World Bank for capital increases to support greater infrastructure investment in the region. The defensive posture struck by the United States in these circumstances fundamentally fails to recognize the potential for leadership in and through multilateral institutions. Clearly, US interests in Asia would be better served through a bigger ADB, in which the United States is a leading shareholder, than they will be through a new AIIB, of which the United States isn’t even a member. The next presidential administration should seek to restore US leadership in multilateral development institutions. To do so, we propose a three-step framework to guide future actions and decisions. The next president should promote a multilateral development agenda by first adopting a guiding policy target for the multilateral share of the US foreign assistance budget. From this starting point, we recommend an inaugural multilateral aid review (MAR) aimed at informing the allocation of funds within this multilateral share and at providing some impetus for stronger interagency engagement on multilateral development policy issues. Finally, we identify measures that would sustain this engagement through relying on existing statutory authorities, roles, and functions. 1 Establish a multilateral target. The next administration should use the White House-led Interagency Policy Committee (IPC) on Global Development to establish a target for the multilateral share of US foreign assistance. Given the political challenge of shifting large portions of the budget at once, and absent a nonarbitrary starting point for a multilateral target, the best approach is an incremental one. For example, the White House–led interagency process could make an initial commitment to increase the multilateral share from 16 percent to 20 percent over a three-year period, yielding an additional $1.2 billion annually for multilateral assistance. Reassessment of this target could then be a part of the ongoing engagement outlined below. This process would allow for a smoother reallocation of resources from the bilateral side of the US foreign assistance budget and a more orderly scaling up of resources in the MDBs. Assuming a flat overall budget, this implies some cuts to bilateral programs, but they would be very modest, less than 5 percent of the bilateral assistance budget. 2 Conduct a multilateral aid review. Multiple donors have initiated MARs, which evaluate and rank all multilateral agencies receiving government funding against a standard set of criteria, including operational efficiency, program effectiveness, and alignment with the donor’s national priorities. The purpose of a US MAR would be to help guide the government’s decision-making and prioritization within the multilateral portion of the foreign assistance budget. An effective MAR depends critically on the multilateral share target discussed above. One risk of a multilateral review versus a comprehensive foreign assistance review (multilateral and bilateral) is that bilateral programs will escape the critical scrutiny that is being applied to multilateral programs. As a result, any criticism of multilateral programs within the MAR could be grounds for cutting multilateral funding relative to bilateral. The ex-ante multilateral share target serves to guard against this outcome. The analytical framework of the MAR would be constructed by a core agency working group (State, Treasury, USAID, and MCC, with its data-driven approach to policy decisions) coordinated by the Global Development IPC. Agencies would be tasked with engaging with their respective multilateral partners to collect evidence and report results. And while we have emphasized the MDBs in characterizing multilateral channels and programs, the MAR would appropriately assess all multilateral assistance, including the (much smaller) funding provided to UN agencies for development purposes. Existing comparisons of MDBs and UN agencies, such as the UK’s MAR, demonstrate that not all multilateral programs are created equal, with UN programs tending to significantly underperform as compared with the MDBs. The process of constructing a MAR framework would give life to a more robust interagency decision-making process around multilateral funding issues and force an internal discussion about the relative weight to place on sectors and regions. For example, how much does the United States wish to prioritize infrastructure investment relative to global health when it comes to multilateral contributions? While we may be able to infer an answer to this question now based on budget outcomes, in reality there is no direct policy deliberation that seeks to answer it. An additional key value of the MAR framework would be the clear articulation of criteria for assessing these institutions. Given the considerable body of work to date, there would not likely be many surprises about which multilateral institutions “perform” better than others on criteria such as budget overhead or transparency. But the relative weight the US government places on these measures and others, particularly around strategic alignment, would be illuminating in its articulation (to US taxpayers, the MDBs, aid recipients, and other donors) and would usefully help guide policy in its construction. 3 Make better use of existing coordination mechanisms. Treasury-chaired National Advisory Council on International Monetary and Financial Polices (NAC): By law, Treasury is tasked with coordinating policies related to the MDBs through the NAC, an interagency policy committee. Given this statutory responsibility, Treasury should play a leading role in MDB-related funding decisions, which points to the need for clarity around roles between the White House–led process and the NAC. OMB: The OMB-led budget process will benefit from the guidance of a multiyear, multilateral funding strategy. As it stands, OMB has struggled to incorporate multiyear financing commitments such as US pledges to IDA or the Global Fund into an annual budget process. Bringing these commitments together under a common policy framework would improve the quality of OMB’s guidance in this area as well as the quality of the interaction between OMB and the respective US line agencies. State and USAID: A number of multilateral funding decisions are internal to State and USAID. In the same way the Treasury-led NAC process would need to be better aligned with the multiyear strategy, multilateral decisions within State and USAID would need to adhere to the agreed-upon principles and priorities. The interagency process would also be improved by more discussion in the NAC of MDB-related funding decisions made by these agencies. Of course, coordination between the administration and Congress is also critical. Although the reforms articulated here do not require changes in law, congressional action in favor of this agenda could be highly beneficial in sustaining the reforms across administrations. Congress has in fact been more supportive of multilateral channels than is commonly perceived, providing over the past decade slightly more funding than requested for multilateral programs and slightly less than requested for bilateral assistance channels. The United States has valued its multilateral partners over many decades. In recent years, rhetoric and policy engagement suggest that the US government continues to value institutions such as the World Bank and the regional development banks as instruments of US development policy. Yet budgeting for foreign assistance is increasingly telling a different story, one in which the multilateral funding relationship is undervalued and disconnected from policy. The MDBs are operating in an increasingly dynamic landscape, with new sources of financing tempting them away from traditional funding arrangements and with new multilateral institutions emerging in which the United States is not a member (e.g., the AIIB and the New Development Bank). From a narrow budgeting perspective, this seems to mark an advantageous moment for the United States to step back while others step forward. But just as the United States chose to lead a multilateral development agenda at Bretton Woods as a way to promote peace and prosperity in a post–World War II era, today’s officials should take a more expansive view toward US multilateral leadership. The United States can continue to be a force for good in the developing world, perhaps no more so than when it chooses to work in the cooperative spirit that defines multilateralism. US White House, “Presidential Policy Directive on Global Development,” September 22, 2010, 6. US Department of the Treasury, “International Programs Justification for Appropriations, FY 2013 Budget Request,” n.d., 2. US Department of the Treasury, “Treasury Department Statement on the U.S. Position on the World Bank’s Eskom Investment Support Project,” April 8, 2010. Pew Research Global Attitudes Project, “Chapter 1: Attitudes toward the United States,” in America’s Global Image Remains More Positive Than China’s (Washington: Pew Research Center, 2013), 8–18. Nancy Birdsall and Homi Kharas, The Quality of Official Development Assistance (QuODA), 1st and 3rd Eds., (Washington, DC: Center for Global Development; Global Economy and Development at Brookings, 2010 and 2014); William Easterly and Tobias Pfutze, “Where Does the Money Go? Best and Worst Practices in Foreign Aid,” Journal of Economic Perspectives 22(2): 29–52; Stephen Knack, F. Halsey Rogers, and Nicholas Eubank, “Aid Quality and Donor Rankings,” World Development 39(11): 1907–17. QuODA is an ongoing joint initiative by CGD and the Brookings Institution to assess aid quality for 31 Development Assistance Committee member countries and multilateral agencies according to four dimensions of aid quality that draw upon international declarations: maximizing efficiency, fostering institutions, reducing burden, and transparency and learning. For more information see the Center for Global Development, “Quality of ODA (QuODA)”, www.cgdev.org/page/quality-oda-quoda. US President’s Emergency Plan for AIDS Relief, “Focus, Partner, Achieve: An AIDS-Free Generation; Latest PEPFAR Funding,” www.pepfar.gov/documents/organization/­189671.pdf; Curt Tarnoff, Millennium Challenge Corporation, CRS Report 7-5700 (Washington: Congressional Research Service, 2014). African Development Bank, “Sustainable Energy Fund for Africa Scales-Up Operations with USAID Support,” www.afdb.org/en/news-and-events/article/sustainable-energy-fund-for-africa-scales-up-operations-with-usaid-support-12292/. Scott Morris, “How China and the United States Can Come to Terms on AIIB,” Boao Review, January 19, 2015, www.boaoreview.com/Opinions/Finance/­20150119/483.html. Trying to match, for example, the OECD average multilateral share of 41 percent would imply a nearly $8 billion annual increase over the current level of $5 billion. Even if a reallocation at this level were politically feasible, it is unlikely that the United States could effectively channel such an increase through multilaterals without raising questions of absorptive capacity and disrupting governance arrangements within the MDBs, which are tied to funding contributions. Starting with the UK government’s first high-profile MAR in 2011, other large donors have followed with their own reviews, in addition to an annual multidonor Multilateral Organisation Performance Assessment Network exercise. With this proliferation of official reviews, the multilateral institutions themselves are suffering from review fatigue, and the OECD has raised concerns about multiple assessments. But these concerns are misplaced when it comes to the United States. As the second-largest multilateral donor, with the potential to be significantly larger, the United States should conduct its own comprehensive, data-driven review following the establishment of a multilateral target. We do not believe a transparent, comprehensive foreign assistance review would be politically or practically achievable. A multilateral review entails a much smaller universe of actors and is naturally at arm’s length from the programs in a way that a bilateral review could not be.